Do you regularly experience back pain? Your mattress could be to blame. Sleeping on a worn-out mattress can contribute to lower back pain. Unfortunately, getting a new mattress can be pricey – but a mattress topper is an affordable alternative. This guide will explore some options and help you find the best mattress topper for back pain. For the most part, a good mattress topper for a bad back will be one that’s on the firmer side. Generally, back pain sufferers should try to sleep on their backs on a relatively firm mattress. For side sleepers with back pain, a somewhat softer mattress topper may be a better choice. The main benefit of mattress toppers is affordability. While getting a good mattress for back pain might cost you $1,000 or more, you can get a high-quality mattress topper for $100-$200 or so. Keep reading to see our recommendations! When it comes to choosing a mattress topper for a bad back, there are a lot of options! To help our readers navigate through a sea of potential choices, we narrowed it down to just a handful of the best back pain mattress toppers. The Sleep On Latex Pure Green a great choice for those who sleep on their back. It’s an extra-firm model, which is ideal for back sleeping. Those who enjoy firm support with just enough give to cradle your body will enjoy this topper. 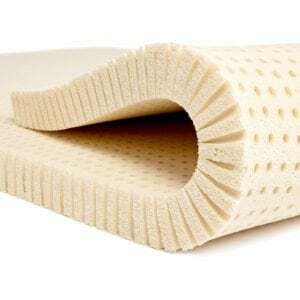 This product is also made from 100% natural latex, which has some advantages over other types of foam. For one, latex tends to be more durable than traditional memory foam. It also tends to cool better, so it’s good for hot climates and individuals who tend to sleep hot. And, it’s naturally hypoallergenic. This topper is actually available in several different configurations. You can get it in various firmness levels and various thicknesses (ranging from 1″ to 3″ thick). It’s earned excellent ratings in mattress topper reviews, and it also tops our list of the best firm mattress toppers. The Advanced Sleep Solutions topper is a great choice for side sleepers. It’s a bit softer than our previous recommendation, and falls right around the middle of the firmness scale. This is a great level of support for side-sleepers, who typically need somewhat softer mattresses, but don’t want anything too soft. 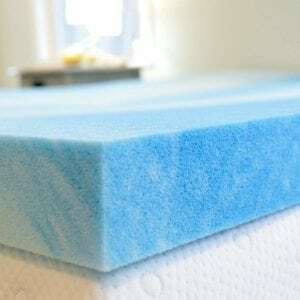 This topper is made from advanced memory foam that’s infused with cooling gel. This helps to dissipate heat, resulting in a cooler sleeping experience even in the heat of summer. The topper also uses an open-cell design, which improves airflow and cooling even further. This 2″ thick topper is affordable, well reviewed, and made by a trusted company. It’s also made with CertiPUR-US Certified Foams, meaning it’s free of harmful chemicals. And lastly, it’s backed by a 3-year limited warranty, and a 60-day money-back guarantee! Click here to learn more! 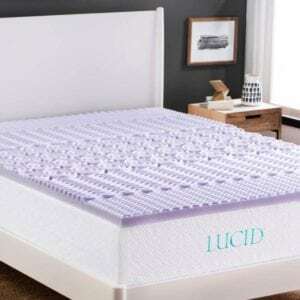 The LUCID 2″ memory foam mattress topper a very affordable mattress topper for lower back pain. Despite the low price, it’s a very high quality product that has consistently earned great reviews from customers and experts alike. If you’re on a tight budget, this may be the best mattress topper for back pain on the market today. The design of this mattress topper is unique. It has a 5-zone design which helps add targeted support to the areas you need it most. It’s also lavender-scented, which may help you drift off to sleep (lavender is a popular aromatherapy sleep-aid). The LUCID topper also comes with a 3-year warranty. For the price, it’s tough to beat. Click here to learn more! Wondering why you should trust our recommendations? First and foremost, our team has the experience to back up our recommendations. Chris Brantner, the owner of SleepZoo, is a Certified Sleep Science Coach. He is routinely quoted in mainstream publications including Forbes, NBC News, and more. Second, we conduct rigorous research and testing to choose our recommended products. By combining intensive online research with hands-on testing, we are able to make the most well-rounded and accurate recommendations. And third, our team has a true passion for the world of sleep, and for helping our readers get better rest. We work hard to produce buying guides like this one, sleep tips, and coverage of the latest sleep science in order to keep our readers informed and sleeping well. Feel free to explore the rest of SleepZoo! Sleeping Position – The best mattress topper for back pain really depends on the sleep position of each individual. Back sleepers will need a medium firm to very firm composition, while side sleepers will do better on a medium to medium firm composition. This is why we picked products specifically based on sleep position. Comfort and Support – Clearly, getting a comfortable and supportive mattress topper is vitally important for those suffering from back pain. The problem with some products is that they are comfortable, but they aren’t necessarily providing the support your back needs. This is why firmer mattresses tend to be better – even if they may not initially feel as comfortable as softer options. Quality & Value – Because you want a product that will last a long time, we focused on finding high-quality, durable mattress toppers. We did our best to balance value and quality, picking high-quality yet relatively affordable options for our readers. Looking for a few more options? Read through our guide to all the best mattress toppers on the market!